This FJ40 brings back more of the early Land Cruiser style and features subtle modern updates that reveal themselves in unexpected ways. 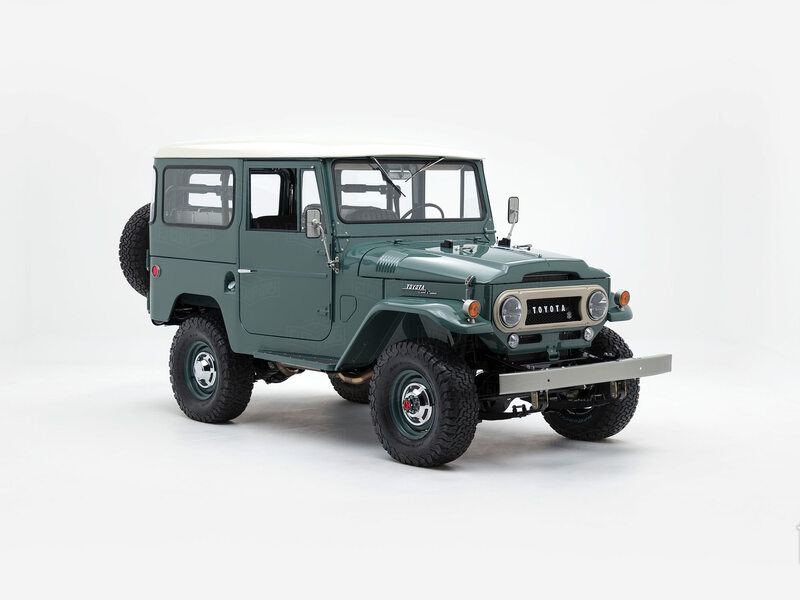 The FJ40 is one of the most popular Land Cruiser models of all time, with countless options and configurations, which gave us lots of possibilities to work with. This particular project began with an authentic 1967 FJ40 hardtop with a flip-down rear hatch with small double doors. We perfected and repainted this unique body in Cloudmist Grey (a custom color) and outfitted this ride with features that are reminiscent of early FJ40’s — features like the retro side mirrors, rounded front grille and side markers, and the gorgeous chrome fin that adorns the hood. The FJ Company Sport is perfect for those seeking that classic Land Cruiser look, with modern refinement and a more powerful engine. For this build, we swapped in a Toyota 1FZ engine, a 24-valve straight six upgraded with programmable fuel injection, and mated to a 5-speed gearbox. Old Man Emu leaf springs smooth out the ride, while our Advanced Power Steering system and front disc brakes give you confidence in a variety of driving conditions. Look inside, and you’ll find a classic cabin that stays true to the original design of the earliest FJ40s with discreet modern amenities. For seating, you’ll find the classic 60/40 split bench up front and jump seats in the back — both trimmed in custom black leather. This FJ40 features two JL Audio speakers in the custom kick panels and a FUSION receiver hidden within the glovebox, all in an effort to retain the cabin’s classic look. The retro knobs that have been part of the Land Cruiser’s DNA for decades, now support modern functionality. Control everything from your headlights to the Vintage Air climate control system with a simple pull or twist. The G40 Expedition keeps the adventure going strong with a Toyota 1GR-FE engine and other modern upgrades. Build yours today!